This hot-pluggable transceiver with SFP+ (Small Form Factor Pluggable Plus) footprint features duplex LC connector and provides up to 1.25 Gbps bi-directional data transfer rate. It supports transmission distances of up to 300 m (984.25 ft) for 62.5/125μm MMF and 500 m (1640.42 ft) for 50/125μm MMF fiber cabling. 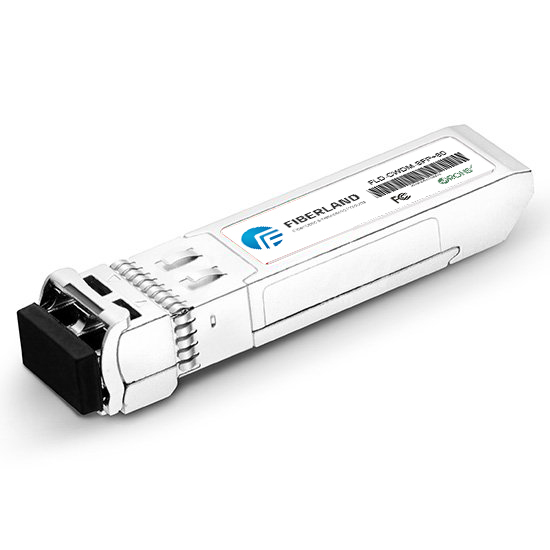 The transceiver complies with Gigabit Ethernet as specified in IEEE 802.3 and Fiber Channel FC-PH, PH2, PH3 and FC-PI 10.0. Additionally, it provides a unique enhanced digital diagnostic monitoring interface, which allows real-time access to device operating parameters such as transceiver temperature, laser bias current, transmitted optical power, received optical power, and transceiver supply voltage. This product has been tested and validated on Dell systems. It is supported by Dell Technical Support when used with a Dell system. It provides 10GBase-SR connectivity for up to 300 meters with multi-mode fiber. Designed specifically for BLADE Network Technologies’ 10 Gigabit Ethernet switches, this 10 Gigabit Ethernet SFP+ Transceivers module provides excellent performance port-dense networks with challenging thermal environments. The transceiver supports link spans up to 300 meters with the right fiber, and functions as the interface between the physical layer and the data ink layer in high-density datacenter applications, local area networks (LANs), and iSCSI storage area networks (SANs).